A global network of people monitoring bee populations may form an early warning system alerting scientists to dangers threatening the world’s food system and economies. In an article published online Dec. 12 in the journal Conservation Biology, LeBuhn and her co-authors outlined a simple and cost-effective method for enacting a monitoring system. The study found that counting and identifying bees regularly for five years at about 200 locations would produce data accurate enough to detect two to five percent annual declines in bee populations. The program is estimated to cost $2 million and include international sampling sites, although it could be scaled to fit different regional monitoring needs. “The estimated cost of sustaining an international monitoring program is a relatively small investment compared to the potential economic cost of severe pollinator losses,” the study said. Thirty-five percent of the global food supply depends on bees and other pollinators, including crops worth nearly $200 billion each year, according to LeBuhn. “A monitoring program should be simple, repeatable, inexpensive, and, most importantly, have the ability to quickly detect declines if they are occurring,” the study said. 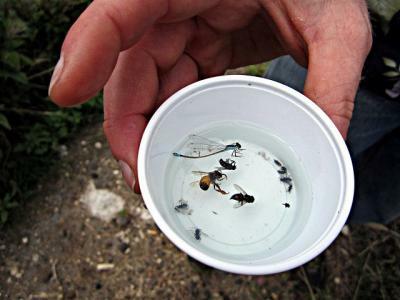 The proposed system relies on paid workers around the globe to count and identify bees using simple “pan traps,” in which bees are attracted to a brightly-colored pan filled with liquid. To determine scalable sampling techniques, costs and time scales for completing the work, the researchers designed simulations using data from eleven previously published multi-year studies. The research was funded by the Food and Agriculture Organization of the United Nations, and the monitoring program has already been used in Brazil, Ghana, India, Kenya, Nepal, Pakistan and South Africa, with support from the Global Environment Facility and United Nations Environment Programme. LeBuhn said the long-term goal for the project is to establish a network of monitoring stations to provide data for a global analysis. LeBuhn is also known for organizing the annual “Great Sunflower Project,” in which 100,000 citizen scientists across North America volunteer to count bee populations in their own backyards. The project, now in its fifth year, recently found low numbers of bees in urban areas across America, adding weight to the theory that habitat loss is one of the primary reasons for sharp population declines.